It’s Football Time in Rhea County!! Game preview by Brian Kamer. Followers of the green and gold no matter how aged or youthful are quite familiar with the Raiders, as Rhea County has faced them an impressive 38 times out of the last 44 seasons of Golden Eagle football. The Raiders are entering their fourth season under Scott Cummings who won a state title with Knoxville West in 2014. On offense, Cleveland will be led by Jackson Moore (#14, QB, Sr.), Jordan Hickey (#5, RB/S, Sr.) and Tre Guilmenot (#15, WR/DB, Sr.)with Alex Higgins (#56, OL/DL) anchoring a strong offensive line. Defensively, Hickey and Higgins will likely contribute greatly at their respective defensive positions with Jake Applegate (#10, LB, Sr.) and Zach Turner (#12, LB, Jr.) holding down two of the linebacker spots. For the Eagles, we get to see just how well this year’s group has mastered Georgia Tech’s signature triple option offense. The new-look scheme will be led by senior Zack Pemberton (#7, QB/S) who is making his debut in his 3rd season as the Eagle starting signal-caller, Jackson Langley (#23, RB/LB, Jr.), and two 2017 All-Region 4-5A defensive standouts Chandler Kaylor (#42, FB/LB, Sr.) and Aulbrey Smith (#13, RB/S, Sr.). Seniors Colton Edwards (#78, OL/DL), Payton Dugger (#57, OL/DL), and Garrett Smith (#52, OL/DL) will lead the charge on the offensive line. On defense, Chandler Kaylor, Aulbrey Smith, Garrett Smith, and Payton Dugger will definitely be key cogs along with junior linebacker and fullback Bradley Goodwin who captured the attention and admiration of the Eagle faithful with his impressive plays on offense and defense during the preseason. The Blue Raiders hold serve in both the overall record (14-24) and the most recent meeting, a 21-14 Raider win at Eagle Stadium to kickoff the 2017 season. However, if there has been one thing for certain about this rivalry, it is the fact that both teams almost always play tough when they meet on the gridiron. On average, Cleveland holds a 21-16 scoring advantage when they face the Eagles with 16 of the 38 meetings being decided by a touchdown or less. 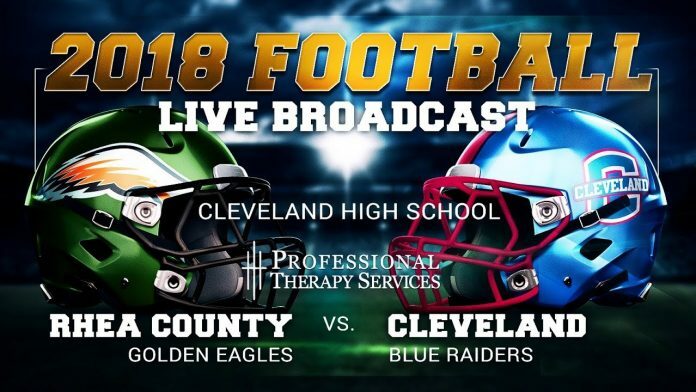 Rhea County and Cleveland have split the last two meetings, with the Raiders winning in Evensville last season and the Eagles winning a close 35-28 game at Cleveland in 2016. This one could be another tight one like we have seen previously. Cleveland has a good amount of speed and a great fan base, but I think the Eagles take this one by a score or two. Look for the new offense to roll and the defense to shine as the Eagles return home 1-0.